Rainwater harvest by Northwest: How this school in Shimla has emerged as an example for other residential schools. 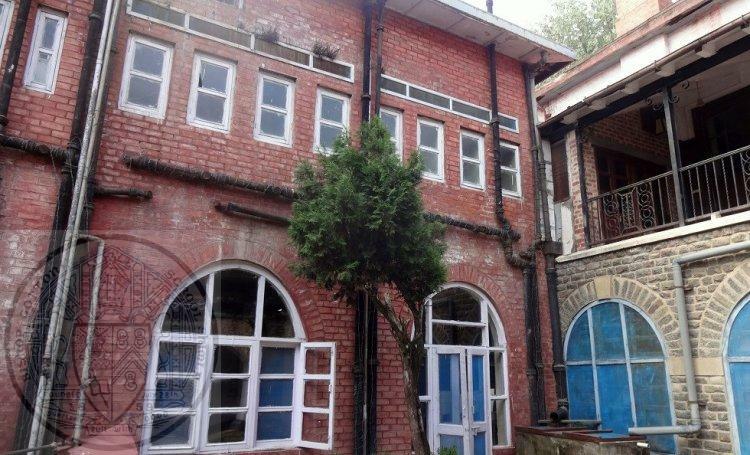 Bishop Cotton School in Shimla tides over water scarcity by harvesting rainwater, setting an example for other residential schools located in hilly regions. Mathew Jacob, estate supervisor at Bishop Cotton School (BCS) in Shimla, remembers when he took his students walking in single file to the nearby stream to wash and bathe every other day in the summers. Shimla is a city blessed with very high precipitation but a poor distribution network which results in water scarcity in the summers. Established in Shimla 1859, the famous boys’ residential school with illustrious alumni including author Ruskin Bond, industrialist Ratan Tata and golfer Jeev Milkha Singh to name a few, was also victim to this crisis. Rising strength of the students and staff continued to burden the already stressed supply but the school managed by hiring water tankers and providing only short supplies to residents. For Jacob, it was a situation that could be easily handled. “I belong to Kerala where we have traditionally been harvesting rainwater in wells and ponds. At a household level, we hang a muslin cloth over four sticks and the rainwater passing through the cloth is collected in a pot to be used for drinking and cooking,” he says. The concept of rainwater harvesting is simple but to implement this at an institutional level, technical know-how especially about filtration and plumbing systems was required. Help came in 1992 from the Council for Advancement of People’s Action and Rural Technology (CAPART), which was running a programme on rainwater harvesting for institutes. Two storage tanks were dug and lined with polythene to collect rainwater from rooftops. Though the programme ran only for two years, it introduced the school management to the basics of the required set up. The storage tanks were fortified with cement and new structures were built with links to the rooftops. Already slanting roofs of the buildings in the hills easily fit into the scheme of things. By the year 2000, rainwater was also being used for flushing in the washrooms and bathing. The school also got four borewells of which two are still functional. The water falling on around 1350 square metre of rooftops is collected at different locations. The rainwater is led through a mesh which stops pollen, pine needles and monkey droppings from going into the filtration chambers, which are mainly lined with pebbles, coarse sand and charcoal. The filtered water is then sent to the storage tanks from where it is either pumped to the overhead tanks for use in the toilets and kitchen or for gardening. The water from the storage tanks is also sent to the central filtration plant before its use for drinking and cooking. “When I joined here 22 years ago, we had a storage capacity of just 14,000 litres. Today, there are four storage tanks with a capacity of around 7 lakh litres. Of this, rainwater makes up around 3 lakh litres,” Jacob says. The daily water demand of the school is around 1 lakh litres of which 60 percent is met by the Municipal Corporation. “During lean months, this supply further reduces but we have enough water for the residents, and water tankers are not required,” says Rabinder Kaul, former incharge of the school’s Nature Club. The experience also inspired the school to look for natural solutions to a challenging situation. In April 2006, the swimming pool had no water due to a supply problem from the Municipal Corporation. The management decided to hire 24 water tankers at cost of Rs 60,000 to fill the pool as swimming classes were getting delayed but before that could happen, clouds gathered and the management changed its mind. 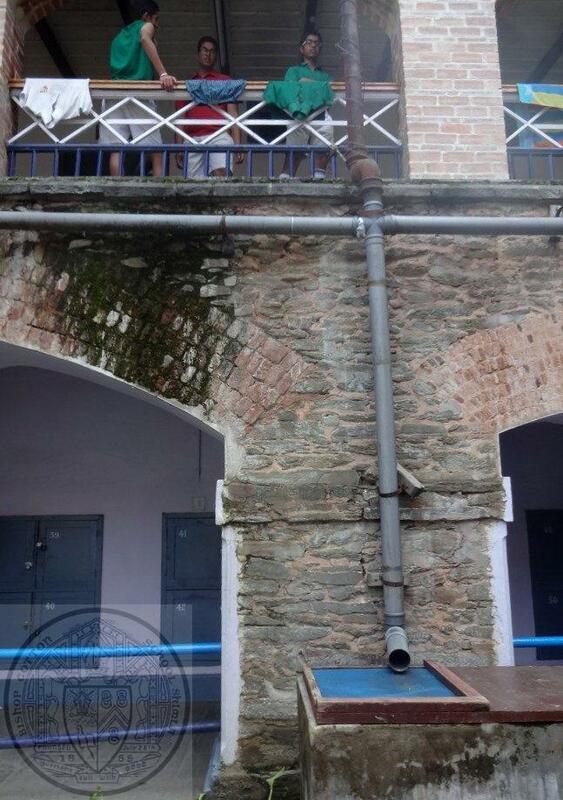 “Rainwater flowing out through the open drains was diverted towards the pool downhill. It was made to pass through a steel tank lined with filter media. By next morning, the pool was filled to its maximum capacity of around 2 lakh litres without any expense,” Jacob explains. The school spent around Rs 45 lakh on its water set up which includes the centralised water filtration plant costing Rs 35 lakh. “Though rainwater is usually clean, we were not sure about the supply from the Municipal Corporation. Besides, we also use groundwater through borewells which requires filtration,” Jacob says. BCS has emerged as an example worth emulating especially for residential schools in the hills which are bound to have high water demand but low supply. Originally published on India Water Portal’s blog. Republished here with permission. This entry was posted in News, Post, Spot Light and tagged BCS, BCS News, Spot Light, Water Harvesting on April 11, 2016 by admin. This entry was posted in News, Post and tagged 2015, BCS, BCS News, Mitre, News Letter on December 26, 2015 by admin. We OC’s have planned a musical evening at school on the 17th Oct 5:30 PM onward to celebrate BCS becoming India’s no. 1 Boys Boarding School; Vikram Chauhan’s great achievement; and of course OC’s Buwal & Dr Deepinder won the Raid De Himalaya! We have arranged for Rodriques (a famous band of Chandigarh) to play for us that evening. The HM has extended an invitation to all for dinner that evening. Would like for as many OCs to attend! Looking forward to seeing everyone at BCS on the 17th! This entry was posted in Events, News, Post and tagged BCS, BCS News, Get together, Spot Light on October 13, 2014 by admin. On 26th April Saturday , Bishop Cotton School won Slater Debates 2014, Yashvardhan Singh of Bishop Cotton School was adjudged the best speaker of Slater Debates-2014. Ved Mehta, of St. James’ was awarded the Best Speaker in the first semi-final as St. James’ School, Kolkata managed to defeat Loreto House Kolkata with the topic reading “It is time to end caste-based reservations in India in order to bring about social equality”. The second semi-final featured hosts Bishop Cotton squaring off with international participants Aitchison College, Lahore. . The topic for the debate was “Corruption Is the Price We Pay for Progress”. The fourth speakers of the teams were called upon as the debate was adjudged as a tie. Bishop Cotton ultimately emerged victorious after a keenly contested tie-breaker with Yashvardhan Singh of Bishop Cotton being adjudged the Best Speaker. In the evening, the much anticipated final debate was held between the hosts Bishop Cotton and St. James’ Kolkata with the topic being “During elections, image building makes a mockery of Indian democracy”. The Chief Guest for the evening was Mr. Deepak Sanan, a very senior bureaucrat presently working as additional chief secretary in the Government of Himachal Pradesh. He is an eminent personality, a writer, and writes for various column and almost all newspaper. The 19th edition of the famous Revd. Dr. Samuel Slater Memorial Invitational Inter-School English Debates was won by the hosts Bishop Cotton School, Shimla for the second consecutive year. The debating event which lasted for a period of five days was successful in strengthening bonds between elite schools from across the country as well as maintaining the highest standards of total education. The whole program was conceptualised and planned by the Master Incharge debates Mrs Sushma Kaul under the dynamic leadership of The Headmaster Mr. R. C. Robinson. This entry was posted in News, Post, Spot Light and tagged BCS, BCS News on April 30, 2014 by admin.